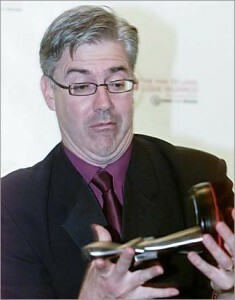 No Logies, but a Molkie – Shaun Micallef Online! As previously reported, when all of the networks had to nominate their stars for the TV Week Logie “Most Popular” awards this year, Shaun was forgotten by both the ABC (for Mad As) and Channel Ten (for Mr & Mrs Murder), so became ineligible for voting by us, the loyal viewers. To add insult to injury, neither Shaun or Mad As Hell were nominated in the “Most Outstanding” category, which is industry voted, although this is partly because comedy falls under the “Light Entertainment” category, so Mad As Hell was in competition with shows like The Voice. So basically, unless Shaun is a presenter – don’t bother with the Logies this year. However, Shaun did win the Gold Molkie – an award given out by the readers/visitors to Molks TV Talk, one of the most popular Australian TV blog sites. It was Shaun’s third win in 3 years, and with 42% of the vote – a very convincing one. Mad As Hell also won “Best In Show”, a testament to the quality of the show, especially this season.